In this video, we will discuss about drilling down and displaying hierarchical data in gridview controls using objectdatasource control. We will be using the following 3 database tables for this demo. Use sql script from Part 34 by clicking here to create and populate the required tables. To use objectdatasource controls, to retrieve continents, countries and cities data, we need to create respective data access layer class files. Step 1: Add a class file with name ContinentDataAccessLayer.cs. Copy and paste the following code. Step 2: Add a class file with name CountryDataAccessLayer.cs. Copy and paste the following code. Step 3: Add a class file with name CityDataAccessLayer.cs. Copy and paste the following code. Step 4: Build your solution, so that the respective data access layer classes are compiled. Step 5: Drag and drop 3 gridview controls and 3 Objectdatasource controls on webform1.aspx. Step 6: Configure ObjectDataSource1 control to retrieve data from ContinentDataAccessLayer. Use GetAllContinents() as the SELECT method. Step 7: Asscociate ObjectDataSource1 control with Gridview1 control. Setp 8: From GridView1 - GridView Tasks pane, please make sure "Enable selection" checkbox is checked. Step 9: Configure ObjectDataSource2 control to retrieve data from CountryDataAccessLayer. Use GetCountriesByContinent(int ContinentId) as the SELECT method. The value for the parameter - ContinentId should come fromt the selected row in GridView1 control. Step 10: Asscociate ObjectDataSource2 control with Gridview2 control. Step 11: From GridView2 - GridView Tasks pane, please make sure "Enable selection" checkbox is checked. Step 12: Configure ObjectDataSource3 control to retrieve data from CityDataAccessLayer. Use GetCitiesByCountryId(int CountryId) as the SELECT method. 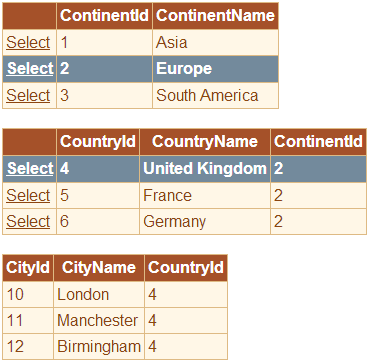 The value for the parameter - CountryId should come fromt the selected row in GridView2 control. Step 13: Asscociate ObjectDataSource3 control with Gridview3 control. 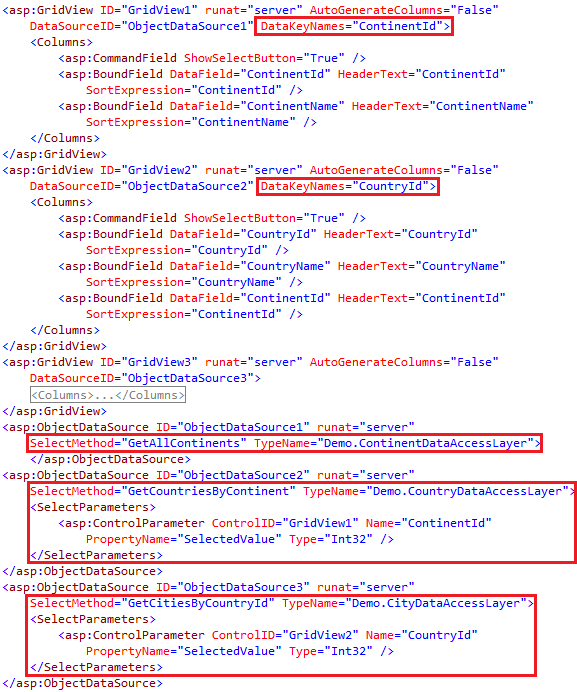 GridView1 DataKeyNames property to "ContinentId"
GridView2 DataKeyNames property to "CountryId"
At this stage the HTML of your webform should be as shown below.